Savor the best of Madrid on a private gourmet tour of Lavapies, one of the city’s oldest districts. Stroll through the evening-lit streets and enjoy the local atmosphere. Each tapa stop is paired with a glass of local wine for an ultimate food experience! Get a taste of Madrid’s culinary scene and explore the local gems in the cool neighborhood of Lavapies. Enjoy delicious tapas paired with local wines and let your knowledgeable guide give you all the insights about the Spanish cuisine. Greet your private host at a traditional local market and wander around the stalls full of fresh products, cured meat, and yummy cheese. Hear about the origins of tapas and get insights about the local ingredients. 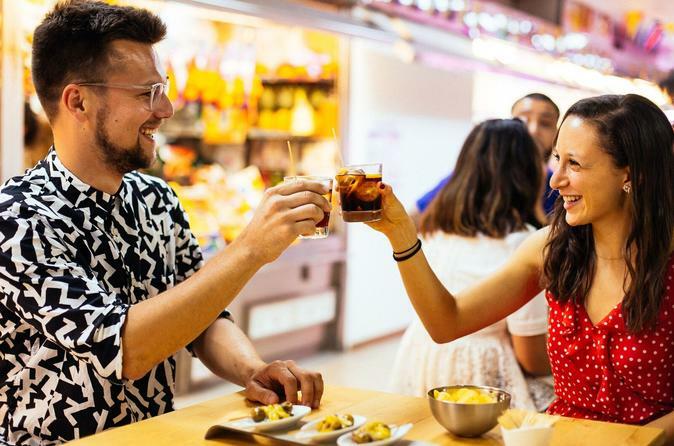 Visit a tiny little bar in the market known for its selection of tapas and enjoy a glass of local wine and an appetizer. With a great ambiance and unique decor, the next place has a very unique atmosphere that you’ll love! Taste local wines, sample a stuffed tortilla tapa and let your private guide tell you about the origins of the wine and its characteristics. The next establishment is one of the most popular places in the Lavapies area. You’ll taste amazing pintxo paired with a glass of wine made by a small local wine producer. Your host will recommend you the perfect wine, suitable for the ultimate gourmet experience. Afterward, stroll through the streets of Madrid and take in the city’s vibe while you admire the local gems. At the final stop, try the world-known Vermouth, a fortified white wine flavored with diverse herbs. The drink is considered the traditional drink of the city and it’s served on the rocks with sparkling water. Accompany your drink with tapas and enjoy your time with your local guide. Your host knows the tastings of each venue, so ask them all your burning questions. Don’t miss the opportunity to taste, enjoy and learn about Spanish cuisine with your friends and family! Let us know if you have any diet restrictions or preferences - this experience can be 100% customized to fit your preferences.